“You major in English? Will you be a teacher or a translator?” One of your relatives asks. “Language is a tool. You need to find a second skill, and what will it be?” Your father questions. “Perhaps they are right. Probably, I should face reality,” you think to yourself. People think that those who major in English are only destined for a few jobs like teachers, translators, or clerks of trading companies. People assume that English major students do not have the ability to be qualified to do jobs in other areas. Language is a tool, but students in the Fu Jen English Department make good use of this tool. Thanks to various activities such as Annual Play, Senior Play, Composition Contest, Singing Contest, among others, we learn more than just the English language. Moreover, courses like finance, translation, literature, and marketing provide students with opportunities to learn about other areas This is why our alumni are active in many fields. Growing up means you have to be responsible for any decisions you make; it does not mean that you stop dreaming. In some interviews with alumni and students of the English department, they share their experiences and their dreams. A small but beautiful and elegant leather shoe shop is located at a corner in Taipei. “Since they are my favorite, how nice it would be if they become part of my life.” Eddie Wu said as he smiled. In speaking of the biggest obstacle to starting a business, Eddie claimed, “Taking everything into account is much more difficult than people think.” Starting a business is about money, either earning or spending. Once you begin, the worst situation is losing every dollar you pay for the business. “But we are young enough to take this risk. We may fail, but we are capable of restarting.” Eddie asserted with conviction. “I love these shoes, and I know I will have a job related to them. I need to gain some experience.” Working at a leather shoe company allows Eddie to earn a living and gain experience at the same time. “However, if you want to start a business with partners, two is the maximum number, or there will be group squabbles,” Eddie recommended. Music is a bond between Samuel Huang and Ben Tseng. One is working, and the other is studying. The two members share one interest but hold different views of music. Samuel and Ben started collaborating through the English Department Singing Competition. Samuel was looking for guitar or piano accompaniment, and he found Ben. “Since then, when I have a performance, Ben is my accompaniment until I graduate and go to work.” Samuel said. Because of previous collaborations, Samuel and Ben decided to team up as a band, SamuelandBen. Samuel wants to seize the opportunity and time to fulfill his singing dream, while Ben, on the other hand, needs experience to prepare for his future. The other issue is to become a Youtuber and create a fan base. "Ben and I covered songs we like at first, but those songs were less familiar to many people. The result was, well… not good. Since then, I realized that the theme and the title of your works are extremely important." As for personal challenges, Samuel has to be responsible for his life and the band simultaneously. “My daily needs, the music equipment, place for practicing, and some other expenses of the band cost a lot. I have to strike a balance. Nothing can be abandoned” Samuel said. Ben, on the other hand, is a student. He started learning music when he was a child. "Since my family let me learn music, I’ve never wanted to give it up, and I even plan to make it my occupation in the future." Because of his achievements in English, Ben chose to major in English rather than in music. “People majoring in music in Taiwan may not have better employment. I probably need to go abroad to learn advanced skills. Plus, if you like music and practice day after day, it won’t be necessary to major in music in order to get music-related jobs,” Ben said. Ben thinks English is a tool, and Ben knows how to make good use of this tool to improve his music skills. “I will eventually go abroad no matter what I majored in college. Therefore, if I can speak English well, I am more likely to get used to foreign countries quickly, ” Ben said. When the band was formed, Ben did not have a clear and specific goal. He only knew that forming a band is workable, so he gave it a try. For Ben, it is a brand new idea. In addition, what he learns from the band may be useful to his dream job in the future. Music-related jobs include many aspects such as recording, playing an instrument and editing. Ben does not know what exactly he will do in the future although he knows it must be music-related. Thus, he wants to gain more experience and be more familiar with this industry. “That is my first step,” Ben said. Ben is certain that music is his future, and English is a tool that helps him to broaden his horizons. For the band, Ben said that of course he hoped it could last as long as it can. “I’ve made my decisions for my future. Everyone has his own goal. A band of two people...I don’t know. 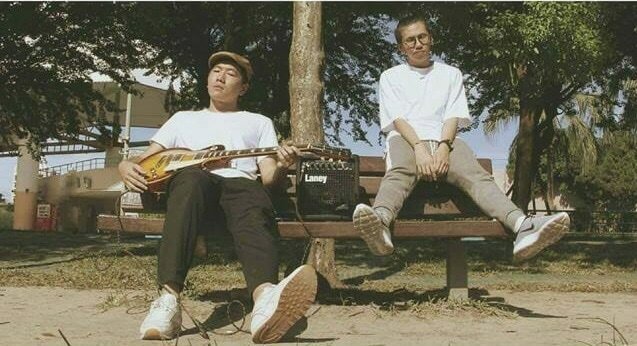 I definitely want it to be famous, and I want us to release more and different works.” Although Samuel and Ben’s style is unique and different, Ben hopes they can make more fans. The lesson Ben learns from the band is that to let people get to know you is difficult. When we think about how those people get famous, we find that most of the time it is because of luck. “How to promote yourself to let yourself shine is difficult.” When the chance comes, will you be ready? Sharon Teng has imagined singing and dancing on the stage like a Korean pop star since she was a senior high school student. Actually, Sharon did not just imagine it. She put it into action when she was in university. From September 2015 to June 2016, Sharon had a chance to travel to Korea as an exchange student where she became a trainee at one of the music schools. The first and also the biggest problem Sharon encountered was her parents’ disagreement, which forced her to choose to study at a “normal” senior high school and university rather than a department related to performance. Nevertheless, Sharon persisted in her dream to become a Korean pop star, regardless of the disagreement of her parents. Intense conflict made their relationship worse until finally her parents were willing to sit down and listen to her. Sharon told her parents about her detailed plan. She would finish her bachelor degree, but she also asked her parents to give her a open door. “Attending an audition does not mean I’m already on it. It is like an entrance. At least, you could give me a chance to know whether I could get in rather than forcing me to turn back on that entrance. Without giving it a try, I will always felt regret.,” Sharon told her parents. Majoring in English seems to be unrelated to her dream. Sharon chose to be an English major because of her achievements in it. “If I failed to become a performance artist in Korea, I would still have my bachelor degree in English, which could guarantee me a job in the future,” Sharon explained. These seniors and graduates are working hard on what they want, and they all started from nothing. Planning is the key. “Find a balance between reality and your dreams. If you are a student now, you have to finish your school work and make your dream come true step by step rather than dropping out and leaving everything behind,” Ben said. “You live your life once, don’t leave regrets,” Samuel suggested. “Give yourself time to enter the field you want to be in the future. Learn the whole process and the field to see whether you like it or not. If you like it, stick with it,” Eddie Wu recommended. Never say you cannot do it before you start. Never admire those masters because you do not know how much effort they have made. A building is built piece by piece, floor by floor. Find out what you want. Stop dreaming. Take action. Make your dream become reality. According to these “fighters,” there are some concrete steps to fulfill your dreams. Detailed map. Draw yourself a blueprint that shows every step you have to take, what difficulties you may encounter, and alternative steps when the original ones do not work. You have to think of all possible consequences and take them into account. Always have a plan before taking action. Stable income. Economic issues are a major concern for most people. At this stage, most people live on their own, so they are afraid of chasing their dreams, for fear that they may lose everything. In this case, you have to simultaneously work on your dream and earn money to support it and your life. Thus, you have to use and arrange your time wisely. Experience. You should have enough experience of what you are going to do. You can professionalize by taking jobs that are related to your dream. Thus, you can gain more experience and earn money at the same time.